In an age of MeToo, proactive diversity and gender blindness (all of which I am heartily in favour) I did start to wonder where all the weird old white men had gone. 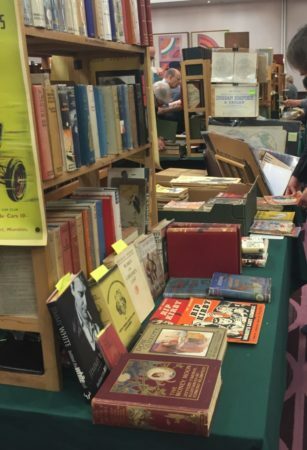 The Pulp and Paperback Book Fair in Bloomsbury brings them out in droves. These are a special breed of hunters, gatherers, collectors and cataloguers, moulting, dishevelled and a bit on the spectrum, lacking even rudimentary social skills but able to spot a first paperback edition by Edgar Wallace from thirty metres. They are almost exclusively male and 60+ and boy, do they know a lot about pre-1900 commemorative hand-coloured German postcards. There are Eastern European professors, hunched elderly scholars and Indian academics – but not a female in sight. For here in leafy Bloomsbury, on the ground floor of the Royal National (sic), London’s least attractive sixties hotel, are a hundred dealers selling the kind of ephemera that would have Arthur Bryant reaching for his wallet. The rooms smell of damp paper, rotting bindings, mildew, unread words and overlooked lives. These are my people. 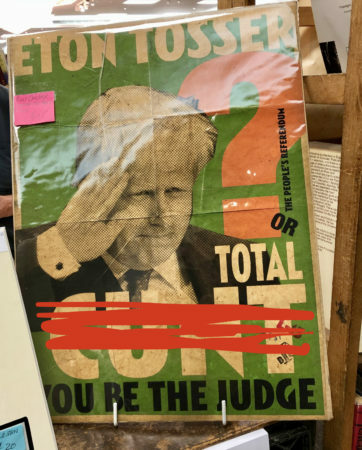 A poster by Billy Childish of Mr Boris ‘Bozo’ Johnson, London’s worst-ever mayor (I tried to obscure it for those overseas readers of a sensitive nature). ‘A Drawing of London’s Devastation Made From A Zeppelin’ (a huge, elaborate foldout of how London looked after the Blitz, with every bombed out street and building etched in great detail). ‘Christmas Card Samples of 1895’ – An immense leather volume filled with beautiful lace cards salesmen would carry about to sell into shops. ‘Toys & Toy Shops of Europe 1900-1950’ – a delightful full colour compendium of toys, puzzles and games, and their emporia. Many of the items on display at first appear desirable and attractive, until you spot that there’s something about them making them unsaleable. For example there’s beautiful Victorian sheet music, but for songs you’ve never heard of. There are bundles of quill-penned letters from people writing in 1770, but they’re boring to read, and handwritten court rolls from even earlier, but it’s impossible to figure out to what they’re referring. Rare children’s books feature minor unloved characters and talking animals who never achieved popularity. Early Victorian postcards from seaside resorts feature lurid, unappealing views. There’s a book of cigarette filter-tip analysis cataloguing cigarettes with actual snouts installed in its fold-out pages, all neatly preserved in rows. The book is both pointless and funny-smelling. I roam the rows, bumping into old friends I’m vaguely surprised to find alive. Excitedly we show each other our wares. I have scored these for almost nothing, you might say unsurprisingly, but the Hancock volume has a rare sketch inside featuring Hancock arguing with his scriptwriters in a pub, and although I knew Gore Vidal wrote pulp under the name of Edgar Box I didn’t know he had published scary stories using his own name. I can’t find an excuse for buying ‘Up Pompeii’. ‘But I don’t want it,’ I explain, now bowing under the collective weight of the bags. I trundle them home, knowing that a/ I have a bargain, b/ I can steal from them wholesale because the author is out of copyright, and c/ I have absolutely nowhere to put them. On the other hand, having spent years going round bookfairs and bookshops buying books by the dozen I’ve started reading the ones I was going to read one of these days, or started wondering why I ever thought I’d read them one of these days. I don’t even have your justification of research. I’m sorry I couldn’t get to the fair,especially after you had reminded me that it was happening this Sunday,but I had a headache. A simple case of supping not wisely but too well! Ha-ha,ouch. Is there a website to find out when the next one occurs and is there any chance of finding a copy of Lady Don’t Fall Backwards? I was going to write something along the lines of this being a typical special interest group. I googled ‘special interest group’ to find it’s organised, political lobbying. I tried ‘obscure’ and ‘niche’ as alternatives to ‘special,’ again, already in use for groups that are organised. Here we have people that are not organised, but have a shared interest in an obscure area such as unusual old books. The interest can be almost anything, though it’s usually something not obviously useful or at least not useful to many people. As well as books, it can be parts for old cars (I had a great time at the Jaguar Spares day two weeks ago). I’m not sure why the people are predominantly male and mature, though certainly it’s in years rather than spirit. I wonder if it’s a need to rebel against the socially imposed responsibility of the traditional, male breadwinners’ working life. If it is and society is becoming more gender blind, will these obscure interests disappear or will more women participate? I hope it’s the latter. not sure why the people are predominantly male… well let’s think for a sec. 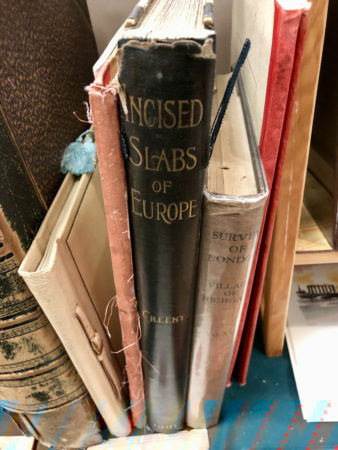 My partner would spend hours at book and antiquarian fairs; his addiction was bad when we were at home but got progressively worse when we lived in the UK. As did his fascination with old pieces of machinery. What was I doing while he ventured forth: grocery shopping, picking up cleaning (mostly his suits), laundry including ironing, meal planning and prep., house cleaning/moving book cases, piles of mouldy books so I and help could clean, writing his children/sending them packages of stuff they “absolutely must have!”, etc. All those things one doing to keep household and family running. I had a large collection of old and rare books, photographs, letters and cards. When I realized that I wasn’t a pharaoh or the Emperor Qin and wouldn’t be taking all this stuff with me when I go, I disposed of the collection to folks who could use the items. My sympathy to partners and spouses of the book fair motley crew. The London books sound wonderful … any more details? So good that I am on another continent, where I make a sincere effort to forget events of this kind. I am drawn to all sorts of old things: books and maps first, then those quill written letters if I could find some (“I can use them as demos of period writing”) and old postcards (“for my friend Diane”) and all sorts. I’ve found a new way of introducing the past into my class, making our own ink and finding uses for gum arabic. It seems to be a mainly male preserve to collect ‘Weird Stuff’. Sometimes, it seems to be unconscious – the jam jars full of rusting screws, nuts, and bolts, none of which actually fit anything; a damp cardboard box full of old hinges; the solid paintbrushes, which, like everything else, “Might be useful one day.” I have boxes full of stuff, which I might get round to sorting out one day (hint: I never will). Don’t you find that if you discover an author you admire, you desire to collect their complete works? 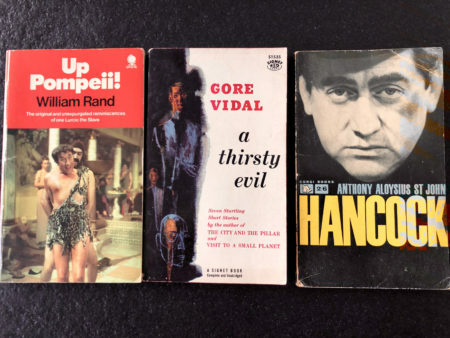 Gore Vidal A Thirsty Evil, Hancock book, Up Pompeii!